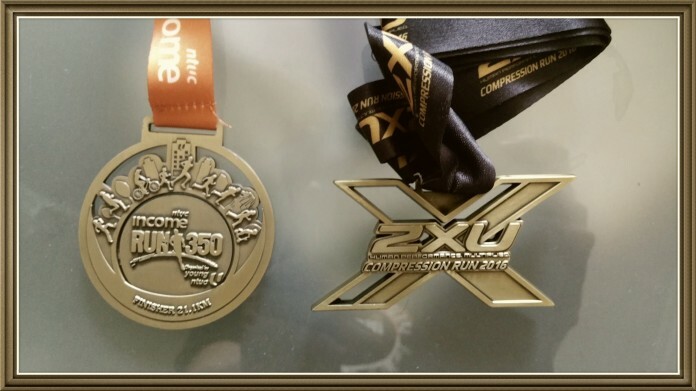 Tale of Two Half Marathons | JustRunLah! 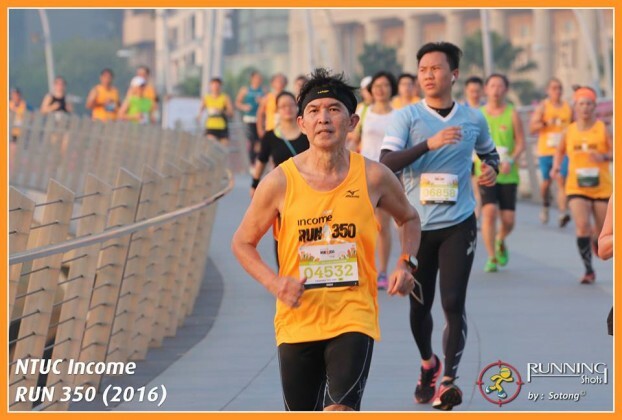 After last year’s 24 races, I thought I would set some different challenges for the new year, my second year of serious running at senior age. One of these was an attempt to run two half marathons one week apart. 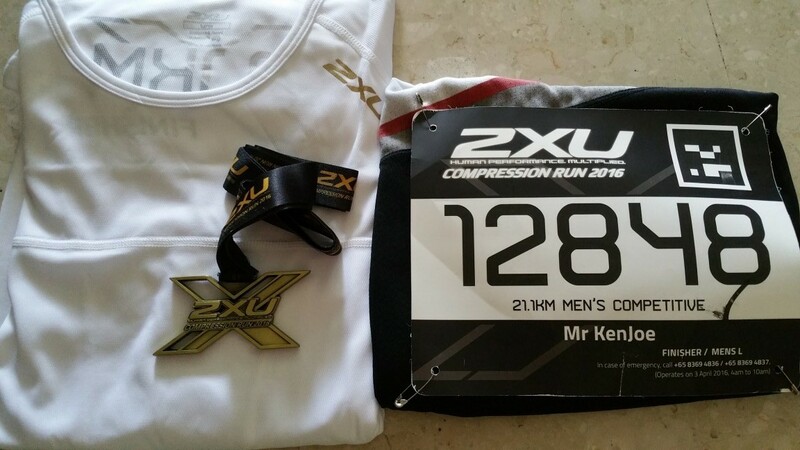 Hence I signed up for the 2XU Compression Run and Run 350 held on 3rd and 10th April respectively. I also googled for ways to prepare and then adapt the principles from them, eg viewing the two races as one race with a gap in between and attempting to achieve a negative split, ie do the second race faster than the first. I was also keeping in touch with new found running friends on FB which had been rather motivating and helpful with their sharing of expert advice or experiences. 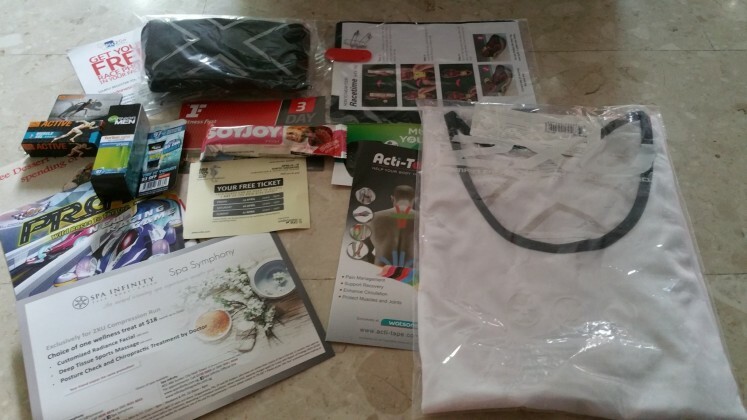 The collection of race pack for both events were uneventful. 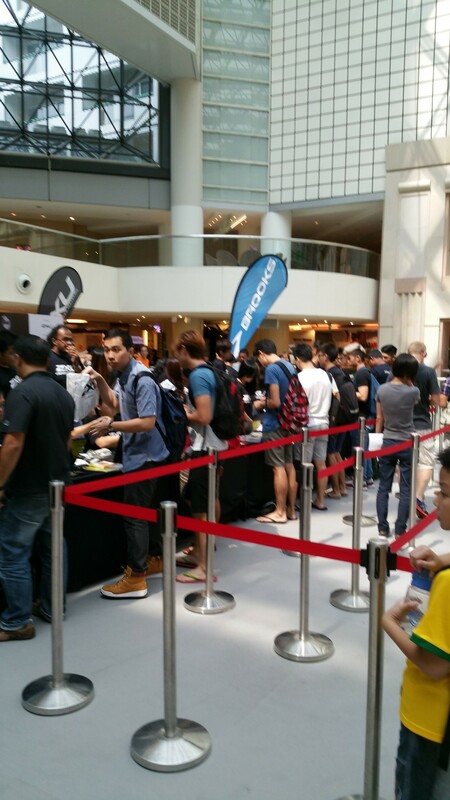 There was no long queue as experienced in most of the previous 5 races I did earlier this year (mostly 10ks). 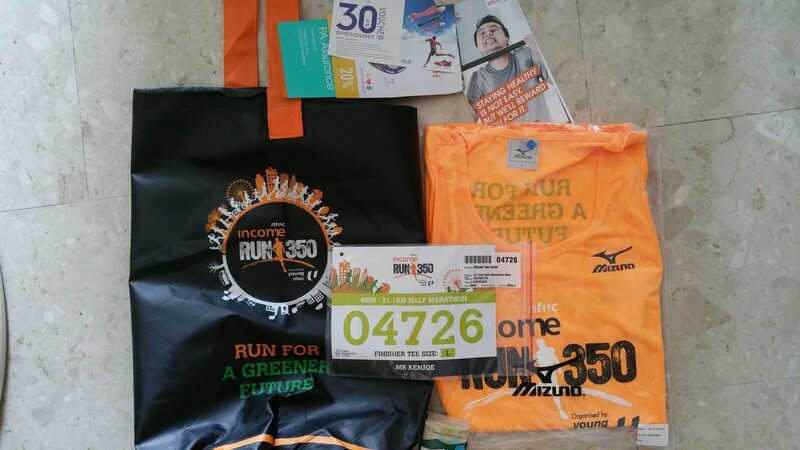 I preferred the white color theme of the 2XU Compression Run and some friends preferred the bright orange color of the Run 350. But as I learnt and experienced in the past, I usually wore my familiar ‘training’ singlets for the actual races, for comfort and to reduce probability of chafing. So I ended up with different colors for the races usually. On the morning of 3rd April, I woke up at before 3.30 am and did my usual pre-race routine before driving down to the venue. I missed the Marina Square Mall carpark and landed at Millenium Walk’s instead. At the race site, I found long queues for the Porta Potty and skipped the usual last ‘release’ from the bladder. Still, I was late and found myself in wave 3. My last half marathon was in February and I managed only 2:43 hr and it wasn’t my PB for halfs. My strategy has been to use races as ‘training’ too to build and sustain my efforts at running. I wasn’t a natural runner so I ran with heel strikes and I was still testing different shoes, and my toe nails have all gone from normal to black and then no toe nails just the last six months or so. Switching to more of forefoot strike was definitely tough for me and unnatural. In some ways, I was taking two steps forward and three steps backwards in the running journey. 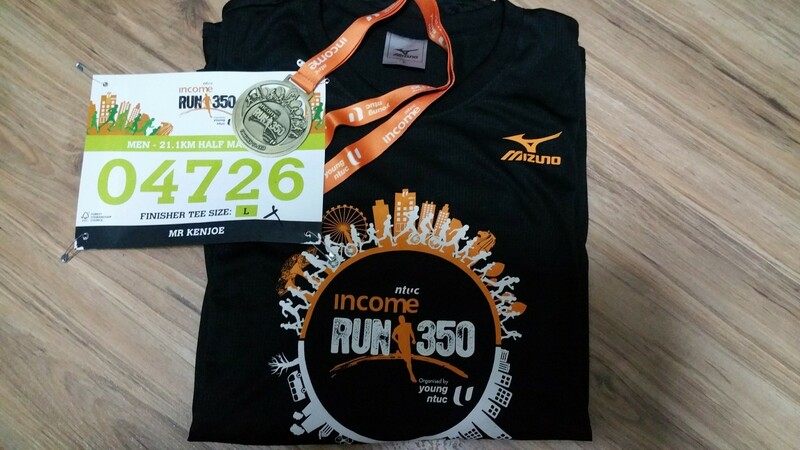 Still, with the races done, I did find some adrenaline rushes when I finished faster and PB, compared to last year’s races, at least for some of them, eg the NUS Biz Ad Charity Run and Green Corridor Run. I ended up buying a pair of Newton Distance III on offer just about two weeks before the 2XU race and thought this would also help me to change my running strike. 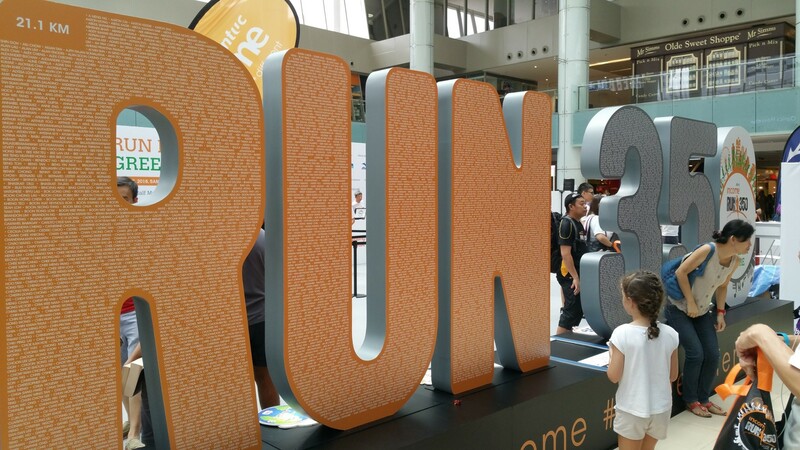 I had read about not trying out new shoes before races but I had not much of a choice given that my old shoes were really worn out and they might cause more problems for me. I have also started to log my mileage using simple excel spreadsheets since December so I was doing at least 100 km per month, the highest being 166 km, each day’s distance ranging from 3 km to about 15 km, usually about 7.2 km. 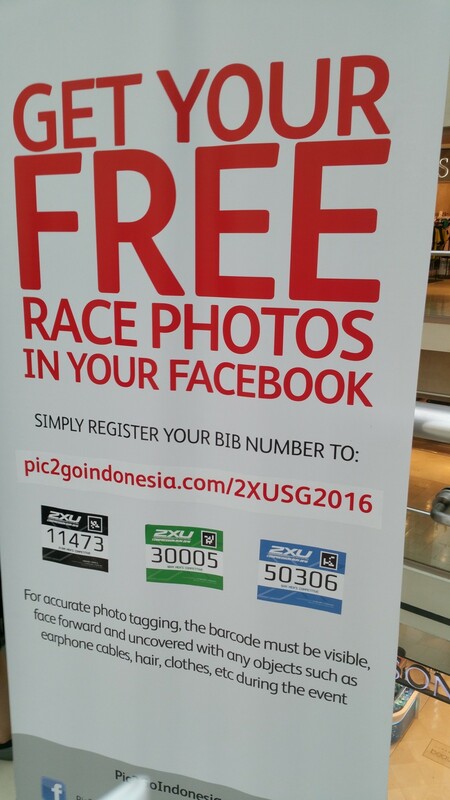 The mileage was inclusive of the race distances. Race One : The wave started off, about 30 minutes after the first wave. There was no hydration point till about 5 km, and after that, it was fairly consistent intervals for water, fewer stations with Pocari Sweat. In my hurry, I had carried only one energy gel and consumed that at about mid point. At about 8 km mark, there was a bad bottleneck as all slowed to walk through a dark narrow corridor, pretty packed when I reached there. This definitely slowed down the pace and disrupted the momentum. Still, I tried my best to get a PB but after the results were released, I only managed 2:38:46. Still, it was better than the last half marathon in February (about 5 minutes’ improvement) despite me feeling that my bladder was filled by end of race. Banana and Pocari Sweat were provided at the finishing point as I collected the finisher T-shirt too. Overall, a satisfying race without too much surprises. 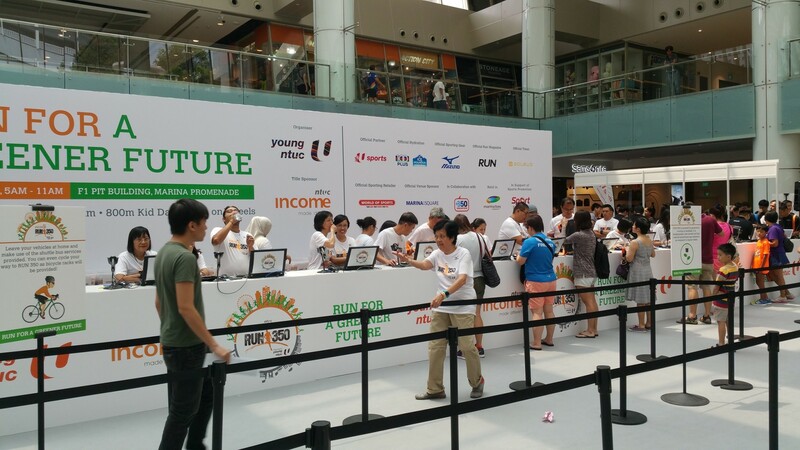 As I had another appointment I rushed back without participating in the activities after the race. But my ‘race’ was not done. So I had to prepare for the next half marathon. 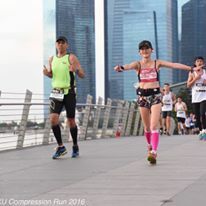 The lucky thing was that my feet were feeling better than previous races though the tip of each toe still had a bit of abrasion. I was thankful that the new shoes didn’t cause any big issues for this round. I noted too that for this race, I ate a bit heavier than usual, the carbo loading that experts advised. For me, I wasn’t a real eater, ie I don’t like to take too much food. In the ‘old days’, my favorites were anything with curry, mee goreng, roti prata and fried kuay teow, probably the ban of health advocates. I weaned myself off from them through discipline in the last few years. 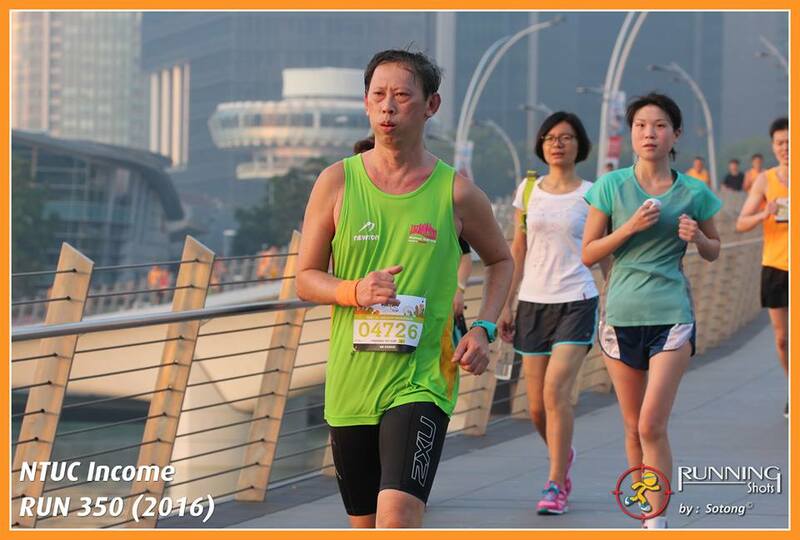 In the past two years or so, I had rarely touched those except maybe, after a full marathon with the occasional prata. But I had taken some extra pancakes with peanut a couple of days before this race, psyching myself that I would expend them during the race and that it was part of my carbo loading. 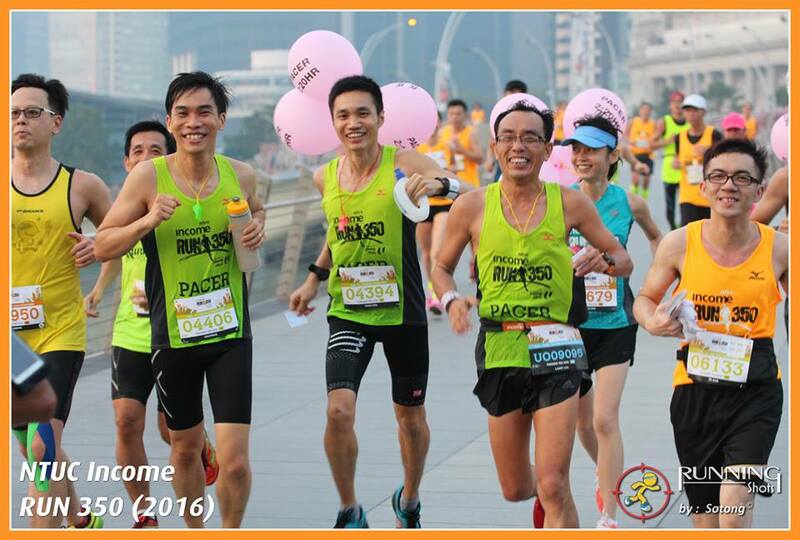 I was pleasantly surprised that next couple of days, I wasn’t feeling as strained or had any sign of pain as in past races. To continue with the race, everything was still alright till about 9 km, when my left foot hit against a slight bump on the road. It was still quite dim then. I stumbled with both feet going extra fast trying to balance myself and in danger of falling headlong onto the hard road. Luckily in those three or five steps, I managed to gain back my balance, but not before I pulled some muscles on my left side of the chest. Actually, luckily no one was taking video, otherwise I probably looked like a cartoon figure with arms swinging wildly to balance myself. So I didn’t fall but the pain on my left chest was rather intense as it radiated to the arm and I slowed my pace. 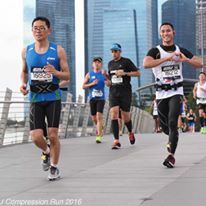 After almost 2 km, the pain disappeared and I ran as normally as I could, determined to hit the negative split for this race. This time I took the energy gel at about 8-9 km, and then at about 15-16 km. And I managed to hit my target. 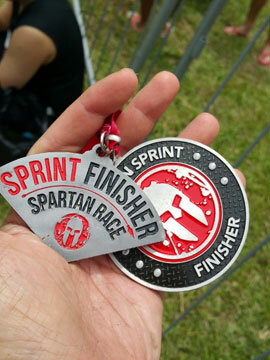 Official nett time was 2 seconds faster than the previous race. I know, it was close, and one split of a second was still a difference. 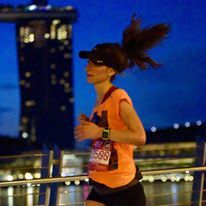 But I learnt from fellow runners that with their GPS watches, the distance was at least 800 m (some say more than 1 km) longer than 21.1 km. So I calculated and estimated another 5 minutes or so, off so I was pretty pleased after receiving the official timing on Tuesday. 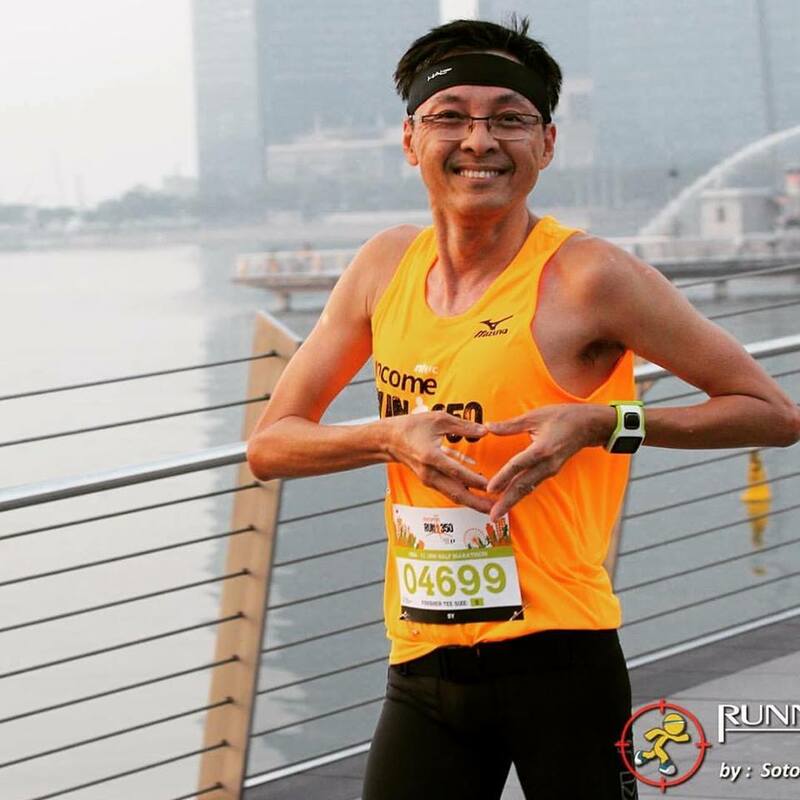 It wasn’t a fantastic PB of any kind for serious runners. 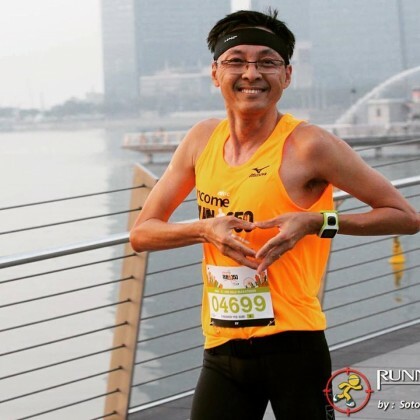 But to us, ordinary amateur runners, or as one of my friends like to call me now, ‘Running Uncle’, this gave a certain level of accomplishment which we knew we earned through our own efforts (sweat, pain and time). 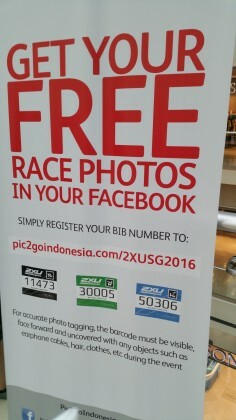 I’ll leave the aftermath till another blog in another race. Now, to live another day to run another race.